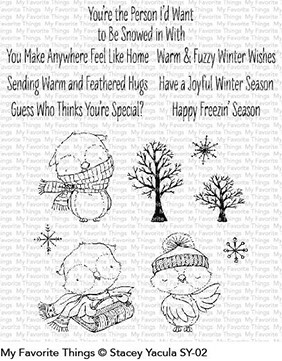 Stamps > My Favorite Things Clear Stamps "SY Warm and Feathered Friends"
My Favorite Things Clear Stamps "SY Warm and Feathered Friends"
Stacey Yacula makes you want to hold each and every character she creates close to your heart. With a gentle squeeze an affectionate pat on the head, you'll happily send Warm & Feathered Hugs to friends far and wide in an unmistakable gesture of fondness. Three endearing owls wear an assortment of cold-weather accessories. Bare trees and unique snowflakes are perfect for creating understated landscapes for these scene-stealing birds while the touching sentiment options cover a variety of occasions. Clear stamp sets include the name of the set on the sticker for easy identification. Our clear stamps and Die-namics are made in the USA.